In a saucepan over medium-high heat, stir together the honey and water. Bring to a boil, and then pour into a medium bowl. Stir in the garlic chili sauce, dill weed and lime juice. Set the dressing aside and cool on fridge. 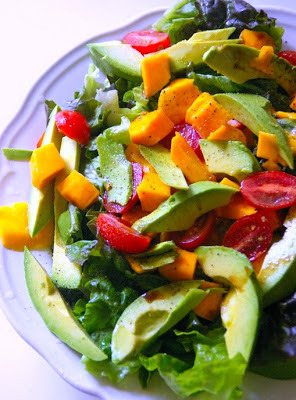 In a large bowl, toss together the tomatoes, mangos and avocados. Arrange the spring salad mix on serving plates. OMG.... This sounds Delish.... Going to make it soon! Thank you Cindi for your comment and opinion. I do recommend this salad, is magnific.